Clothing may have been around for hundreds of thousands of years, with some scientists proposing that it may have been in use even more than 650,000 years ago, though most agree that the first fabric uses occurred about 100,000 years ago. Flax fibers seem to have been the first used for textiles and fabrics, around 8,000 BC, with cotton following around 5,000 – 4,000 BC and wool around 3,000 BC. Starting around 6,000 BC, other fibers such as rush, reed, palm and papyrus were used together with flax (linen) to make ropes and other textiles. Silk also saw its introduction as a fabric around 4,000 BC, in China. Bark and hemp fibers were discovered to have been used in Japan around 5,500 BC. The Silk Route, which began in 114 BC during the Han Dynasty, is credited in large part with the development of the great civilizations of China, Egypt, Mesopotamia, Persia, the Indian subcontinent and Rome, and thus helped to lay the foundations for the modern world. You wouldn’t normally think cloth can have such an incredible impact, but it did. Dress in classical antiquity favored wide, unsewn lengths of fabric, pinned and draped to the body in various ways. When I look at depictions of clothing from the civilizations of Egypt, Greece and Rome, there are common traits: it was made to suit the weather, covering more of the body where it was colder and less of the body where it was warmer, becoming more ornate for the aristocratic classes or for those where certain articles of clothing were symbolic of power, such as those in certain government or religious functions. The fabrics commonly used for these clothes were linen, wool and cotton. The Egyptians used flax (linen) almost exclusively, while the Greeks favored linen and wool and the Romans used mostly wool, though they also used other fibers, such as hemp, linen and small amounts of silk or cotton (which were imported and more expensive). 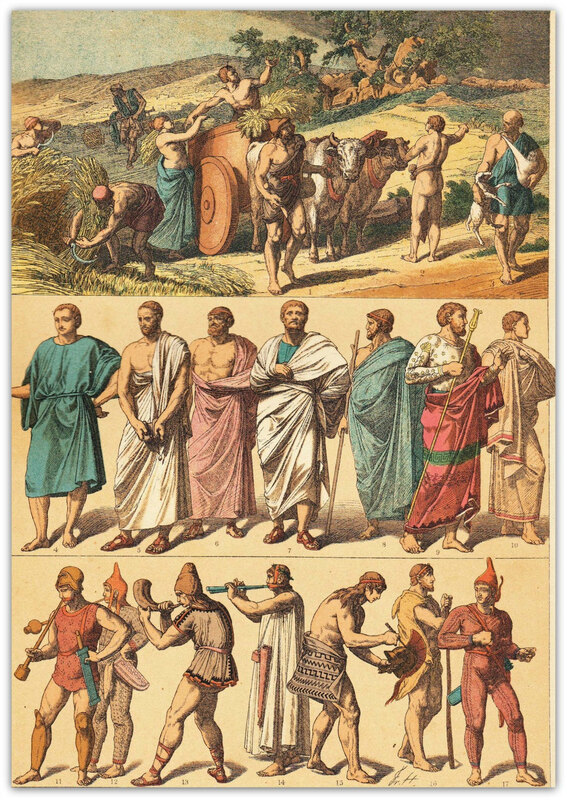 For more info on clothing in the ancient world, you may consult this page. 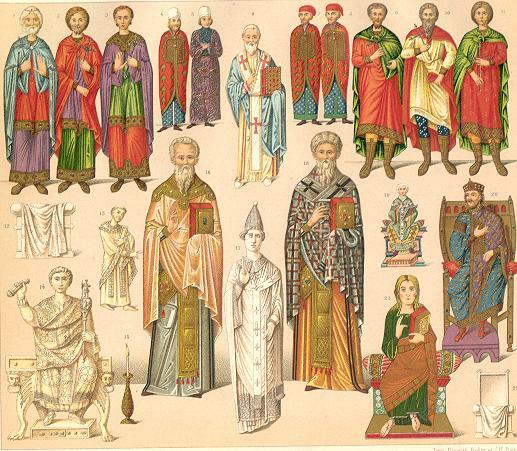 We owe the development of richly dyed, woven, patterned and embroidered fabrics to Byzantium and early medieval Europe. During the high middle ages, the development and dyeing of wool was developed more and more, and we began to see a clear differentiation between wool as outerwear and linen as innerwear. We all know that wool cannot be washed and dried without shrinking, which makes it unsuitable for garments that are washed often, like innerwear. That’s where linen works very well, as it also breathes quite easily. Cotton and silk were still being imported and therefore reserved for ornamentation, not as the main materials. From that time onward, clothes began to change in Europe at a pace unheard of in other places in the world, where styles remained the same for centuries while the Europeans began changing them every year. This is also the period when straight seams and draped garments began to be replaced with what were the beginnings of tailoring, such as curved seams, lacing and buttons. 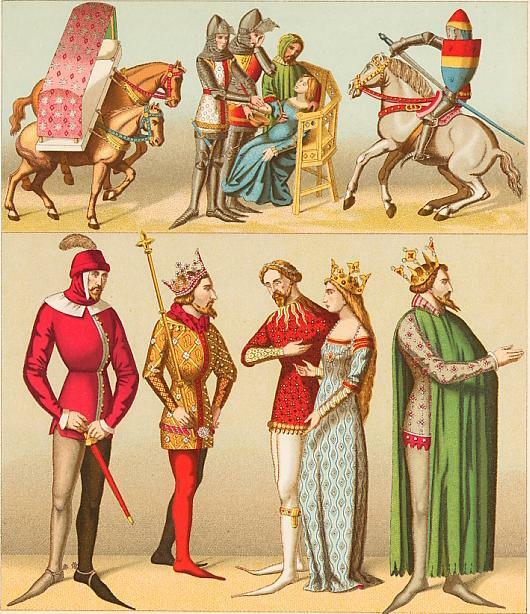 We began to see national variations in clothing during the 15th century. This is also when silk and velvet began to be used more prominently. 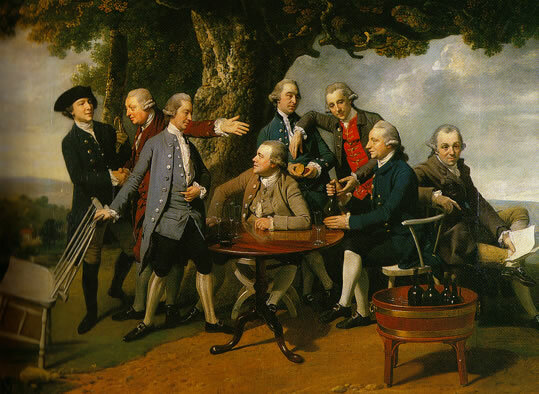 During the 17th century, we find the origins of the three-piece suit — as the coat, waistcoat and breeches (pants, trousers) began to be made of the same cloth. 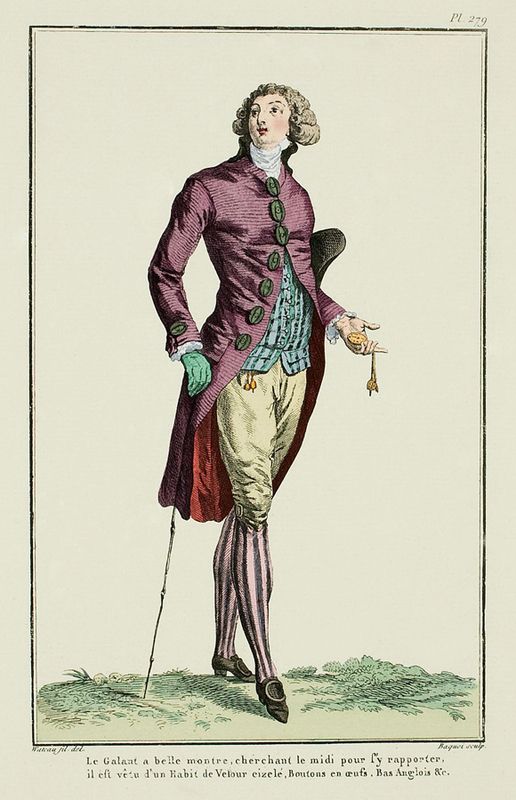 The fellow in this illustration is not wearing a new-fangled three-piece suit, he prefers the foppish look. In the 18th century, fabric production began to be mechanized, but clothing was still being made by hand, as the complicated machines that cut and sew suits and dresses nowadays didn’t exist yet. In the 19th century, sewing machines were invented. 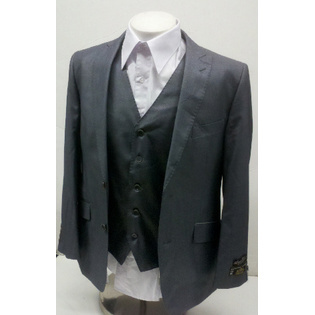 We saw the introduction of synthetic fibers during the 20th century, and from the start of the 20th century going forward, we have seen the gradual decline of bespoke tailoring in favor of mass-produced clothes, most of them from synthetic fibers. Good things have also occurred during this last century. As a result of mechanization and automation, fabrics have become much more affordable and there’s an incredible variety now, as manufacturers constantly experiment with threads, textures, colors and treatments. Clothes have also become much more affordable, and even though they’re made by machines, advancements in computer modeling and the collective data on human measurements gathered over the centuries make it much more likely for you to find an off-the-rack outfit that fits your body nicely now, rather than a few decades ago. One of the goals of my project, “The Elegant Gentleman“, is to show the benefits of natural fibers and of custom-made clothes to those who are willing to listen. Natural fibers are simply better for the body and are renewable, as the sheep will grow wool every year and the cotton and flax will spring up as long as they’re well-tended, while clothes made to your measurements, to your body, will always fit, wear and look better than something you pick off the rack at the store. These two things are immutable. Make sure to also read my article on the various types of fibers that go into the making of textiles, fabrics and cloth.